Web Services in macOS Server, Linux and most versions of Unix are provided by Apache, an Open Source project that much of the Internet owes its origins to. Apache owes its name to the fact that it’s “a patchy” service. These patches are often mods, or modules. 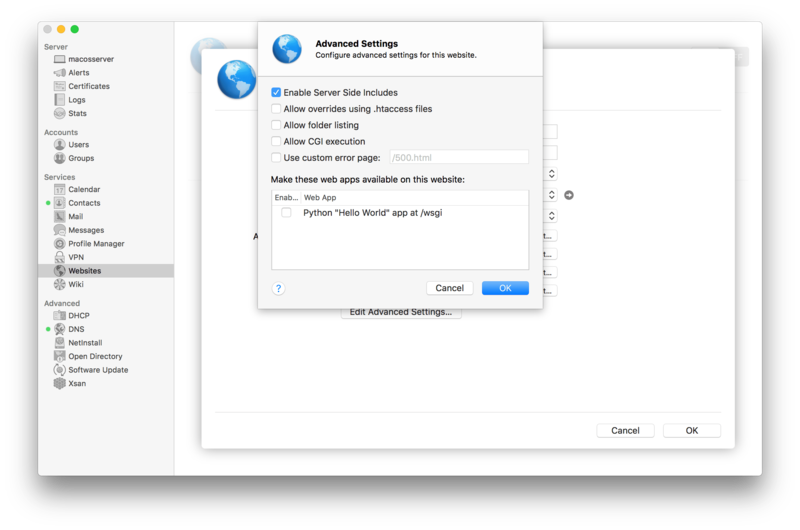 Configuring web services is as easy in macOS Server 5.4, running on High Sierra (10.13), as it has ever been. 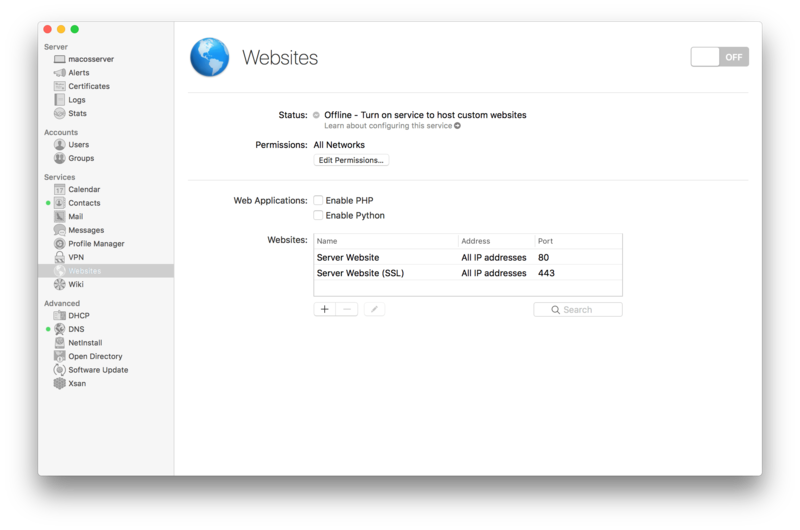 To set up the default web portal, simply open the Server app, click on the Websites service and click on the ON button. After a time, the service will start. Once running, click on the View Server Website link at the bottom of the pane. 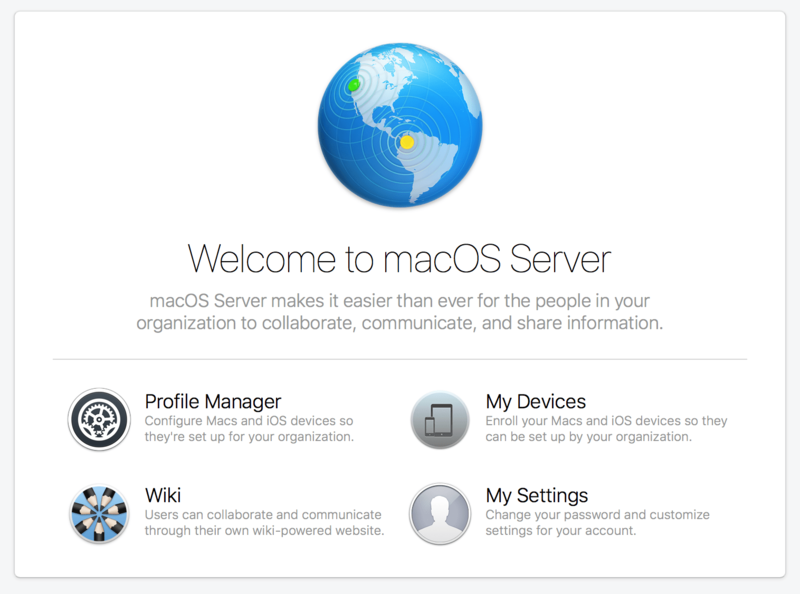 Provided the stock macOS Server page loads, you are ready to use macOS Server as a web server. Before we setup custom sites, there are a few things you should know. The first is, the server is no longer really designed to remove the default website. So if you remove the site, your server will exhibit inconsistent behavior. Also, don’t remove the files that comprise the default site. Instead just add sites, which is covered next. Webmail is gone. You don’t have to spend a ton of time looking for it as it isn’t there. Also, Mountain Lion Server added web apps, which we’ll briefly review later in this article as well, as those continue in Mavericks Server, Yosemite Server, El Capitan Server and ultimately macOS Server 5.2 for Sierra and macOS Server 5.4 for High Sierra. Finally, enabling PHP and Python on sites is done globally, so this setting applies to all sites hosted on the server. Domain Name: The name the site is accessible from. The default sites do not have this option as they are accessible from all names that resolve to the server. Port: By default, sites without SSL run on port 80 on all network interfaces, and sites with SSL run on port 443 on all network interfaces. Use the Port field to use custom ports (e.g., 8080). The default sites do not have this option as they are configured to use 80 and 443 for default and SSL-based communications respectively. Store Site Files In: The directory that the files that comprise the website are stored in. These can be placed into the correct directory using file shares or copying using the Finder. Click on the drop-down menu and then select Other to browse to the directory files are stored in. Who Can Access: By default Anyone (all users, including unauthenticated guests) can access the contents of sites. Clicking on Anyone and then Customize… brings up the “Restrict access to the following folders to a chosen group” screen, where you can choose web directories and then define groups of users who can access the contents. Additional Domains: Click on the Edit… button to bring up a simple list of domain names the the site also responds for (e.g. in addition to krypted.com, add www.krypted.com). Redirects: Click on the Edit… button to bring up a list of redirects within the site. This allows configuring redirects to other sites. For example, use /en to load english.krypted.com or /cn to load china.krypted.com). Index Files: Click on the Edit… button to bring up a list of pages that are loaded when a page isn’t directly indicated. For example, when visiting krypted.com, load the wp.php page by default. Advanced Options: The remaining options are available by clicking on the “Edit Advanced Settings…” button. Enable Server Side Includes: Allows administrators to configure leveraging includes in web files, so that pieces of code can be used across multiple pages in sites. Allow overrides using .htaccess files: Using a .htaccess file allows administrators to define who is able to access a given directory, defining custom user names and passwords in the hidden .htaccess file. These aren’t usually required in an OS X Server web environment as local and directory-based accounts can be used for such operations. This setting enables using custom .htaccess files instead of relying on Apple’s stock web permissions. Allow folder listing: Enables folder listings on directories of a site that don’t have an Index File (described in the non-Advanced settings earlier). Allow CGI execution: Enables CGI scripts for the domain being configured. Once you’ve configured all the appropriate options, click on Done to save your changes. The site should then load. Sites are then listed in the list of Websites. While the health option typically resembles kiosk computers in the Computer Science departments of most major universities, much of the rest of the output can be pretty helpful including the Apache version, whether the service is running, any restrictions on ports and the date/time stamp that the service was started. The final tip I’m going to give in this article is when to make changes with each app. I strongly recommend making all of your changes in the Server app when possible. When it isn’t, use serveradmin and when you can’t make changes in serveradmin, only then alter the configuration files that come with the operating system by default. For example, in this article I look at overriding some ports for some virtual sites that might conflict with other sites on your systems. I also recommend keeping backups of all configuration files that are altered and a log of what was altered in each, in order to help piece the server back together should it become unconfigured miraculously when a softwareupdate -all is run next.